Filmed back-to-back with the current season in Nicaragua, the next season will, according to rumor, bring back two of the most hated, yet loved, players in the game. Actually, make that three. daughter, Lucia Rose! This marks the first birth of a child by two Survivor contestants. Rob and Amber, arguably two of the most popular contestants ever on Survivor, also appeared for two seasons on The Amazing Race and on their own reality show, Rob and Amber: Against the Odds. Amber Brkich competed on Survivor: The Australian Outback, which aired in 2001. Rob Mariano was first seen on Survivor: Marquesas in 2002. Both formed a winning alliance on Survivor: All-Stars, which concluded with Rob’s on-air proposal to Amber during the May 9, 2004 finale. After competing on the seventh season of The Amazing Race as an engaged couple, the two wed on April 16, 2005. In 2007, they took on The Amazing Race again during its All-Star season. Now, the important question. How will the birth affect the appearance of either parent on the upcoming Survivor All-Stars: Heroes vs. Villians? I suspect not at all. Perhaps Rob and Amber have moved beyond that stage of their life and entered a new one? Regardless, some might equate parenthood as a long season of Survivor, wherein in all the participants are winners! Survivor All-Stars: Heroes vs. Villians! 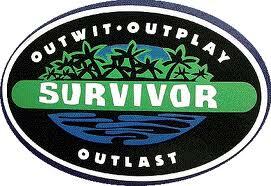 I confess I’ve always been a Survivor junkie. There’s nothing better than dirty (real dirt too), scheming people half naked fighting it out in the wilds of whatever continent they may be on. My intrigue grew when I realize that the last time Survivor filmed two seasons back to back was Survivor: Pearl Islands, featuring America’s favorite Rupert Boneham, and the subsequent Survivor All Stars, won by Amber Brkich, of Rob and Amber fame. The thought just had to cross my mind. Especially after I read this morning that a Federal judge had denied a request from Richard Hatch to attend filming of the 20th season of the series in Samoa. Will we have another All Stars following Survivor: Samoa? Apparently, the answer is YES! I can’t wait to see some old favorites again!